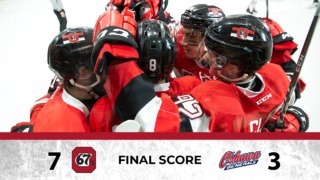 The Ottawa 67’s have won three games in a row and look to make it four and five this weekend at the Arena at TD Place. 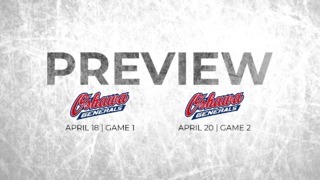 The boys host the Windsor Spitfires, Friday at 7:00pm and the Erie Otters, Sunday at 2:00pm. The only over-ager on the Ottawa 67’s is off to the best start of his career. The 20 year old winger is currently tied for second in the league in scoring with 14 points (tied with teammate Austen Keating) and sits alone as the second overall goal scorer with eight goals. Felly is averaging over 1.5 points per game and is on pace to have a career season. Tye enters the weekend with six points in his last two games and riding a six game point streak. Felhaber has also stepped up his game in the defensive end is becoming a more well-rounded player every single game. Whether it be in the offensive or the defensive zone, you can expect him to contribute this weekend. DiPietro is one of the top NHL goalie prospects in the OHL. The 19 year old goaltender is a Vancouver Canucks prospect and has quite the impressive resume. 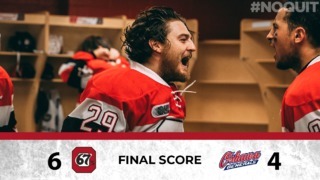 As a 17 year old he back stopped the Spits to a Memorial Cup victory playing in four games with a GAA of 2.00 and a Save Percentage of .932… remember this was as a 17 year old! Last season, Michael did not crack the World Junior roster but was given the call from Team Canada to represent his country at the 2018 World Championship. Although he did not see any tournament action just making that roster as an 18 year old is impressive. DiPietro has solid career numbers with a Save Percentage over .900 and a GAA under 2.75. He’s the kind of goalie that can steal games for his team and will prove to be a tough test for the Barber Poles on Friday night. The highest drafted defenseman in the 2018 OHL Priority Selection will visit the Arena at TD Place for the first time in his junior career this weekend. The 16 year old was drafted fourth overall in the spring and has drawn into the Otters lineup in the top d-pairing. Drysdale has yet to score but is touted as one of, if not the best skating player in his draft class. Drysdale has registered two points so far this season and tallied 50 points in 57 games last season with the Toronto Marlboros. This will be your first chance to this top prospect of the 2020 NHL Draft.